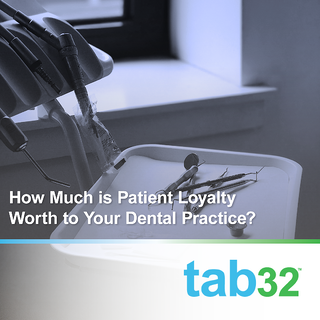 How Much is Patient Loyalty Worth to Your Dental Practice? When it comes to marketing and patient acquisition, finding out the costs associated and value of each patient is key to each practice. You'll need to drill down in your numbers to find out what each patient is bringing in and how much it cost to get them in the door. The tab32 dashboard makes it easy to access these numbers, but if you haven't started your practice yet, or you're brand new, it's impossible to grasp this data. What we know, after years of building our cloud-based dental software and working with dentists is that the worth of your patient loyalty (and the effort you needs to put into building that loyalty) cannot be overstated, or underestimated. It is only to your detriment to ignore these key pieces of information. The Cost to Acquire a Customers (CAC) is the cost of all your marketing divided by your number of patients. The average for this across the country ranges from $150-$300 (something to consider when you set your marketing budget). This number can really add up, depending on how many customers you need to fill your practice. This doesn't include any referrals, and we all know that word of mouth really is the best way to get patients through the door. It's nearly free and those patients are probably more likely to stay in the long-term, and then perhaps make referrals of their own. That's why the value of patient loyalty is hard to put a dollar amount on but absolutely has to be considered when building a practice. At tab32, we want you to not only recover that CAC, but to maximize the lifetime value (LTV) of each patient you bring in. Our software is designed to help you build strong relationships and loyalty with your patients. From smooth patient on-boarding and record-keeping to seamless appointment reminders and text messaging, giving your patients the best experience is important to us. But we don't stop there: our surveys and feedback opportunities give you a built-in opportunity to gather information and testimonials from your patients. This is invaluable when it comes to your policies and having great material to share in your marketing efforts. When your dental practice management software does a lot of the heavy lifting when it comes to running your practice, it allows you and your staff to focus on great customer service and really giving each patient a great in- and out-of-office experience. You have to focus on building loyalty, when you do you ensure not only recovering your CAC, but you build a strong network of dedicated patients. This adds value to your practice while magnifying your marketing efforts.